They clapped when it cleared the launch pad. They oohed in awe as the booster rockets separated, then roared when the pair landed in synchronicity. And they howled with laughter when they saw a car in space. “It was awesome! It was unbelievable to see something so historic,” said Swapnil Pujari. 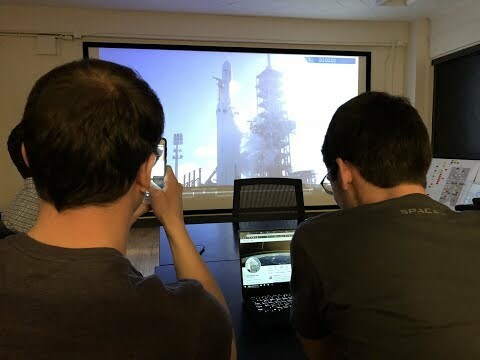 He was one of 30 or so Georgia Tech aerospace engineering students who crowded into a lab in the Engineering Science and Mechanics Building Tuesday afternoon to watch a livestream of SpaceX’s first test flight of the world’s most powerful rocket — the Falcon Heavy. From the sound in the room, the launch was an unquestionable success. It’s hard to imagine what he’ll feel the next time the Falcon Heavy launches. Tuesday’s launch only carried one piece of cargo, a red Tesla Roadster that is expected to orbit the sun for the next billion years. The next Heavy rocket will be stuffed with satellites. One of them is scheduled to be Prox-1, a 154-pound, rectangular-shaped metal box that was built and tested by Jun, Pujari and other Georgia Tech students. It’s the first spacecraft built on campus that will fly in space. Prox-1 is a 24” by 22” by 12” satellite that will deploy a smaller spacecraft, LightSail 2, which will attempt the first controlled solar sail flight in Earth orbit. As that sail unfurls, Prox-1 will move and observe LightSail from a short distance and acquire images of the glimmering structure in action. Georgia Tech will serve as mission control. Prox-1 is currently at the Air Force Research Lab in New Mexico, undergoing a series of tests to make sure the satellite can withstand the rugged, violent ride inside the Falcon Heavy. It’s one of the final pre-flight steps for a six-year project that has included more than 400 Georgia Tech students. From there it will be shipped to Florida and await an official launch date from SpaceX. Although they enjoyed the experience together for Tuesday’s launch, don’t expect many of the same students to gather on campus to watch Prox-1 blast into space. “Oh, I will be in Florida for sure!” said Pujari.